BREATH FLOW THRIVE : Twitter Round Robin! 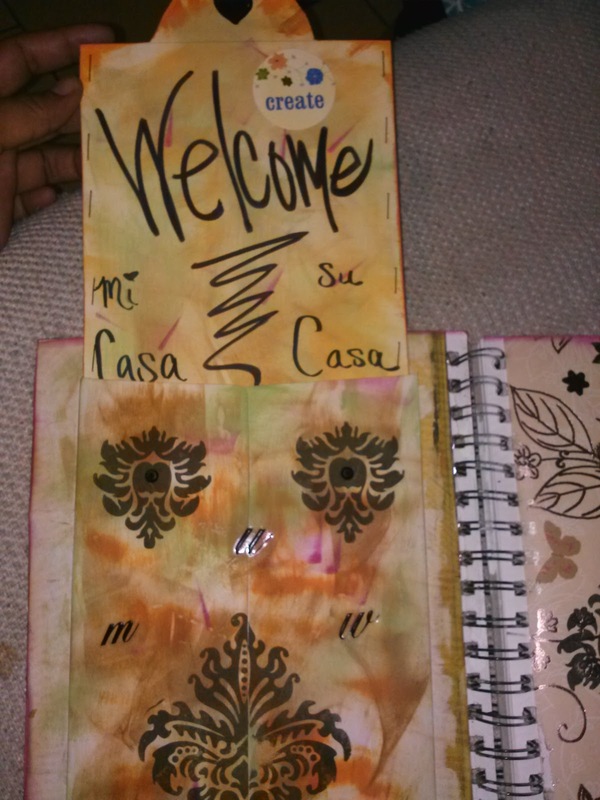 I joined a round robin with some twitter friends and sent off my journal to Robin. She is a life coach and a fantastic artist with motivational and inspiring pieces. She's currently working on this awesome postcard project which inspired me to do my letter project. Also involved in this project is Kelli. I really love her work. It's so, um, it's where I see myself headed. I aspire to create like her. Quite honestly like all the ladies in this project. I'm grateful to be a part of it and look forward to learning from these awesome artists. The third participant is Charissa. Her specialty is The Smashbook, which is very awesome! I love the style in which she captures memories. It inspires me to go outside the box. Go visit these ladies, they each have something unique to offer and I'm grateful to share with you. Here is my journal. I did the cover and first 2 pages. 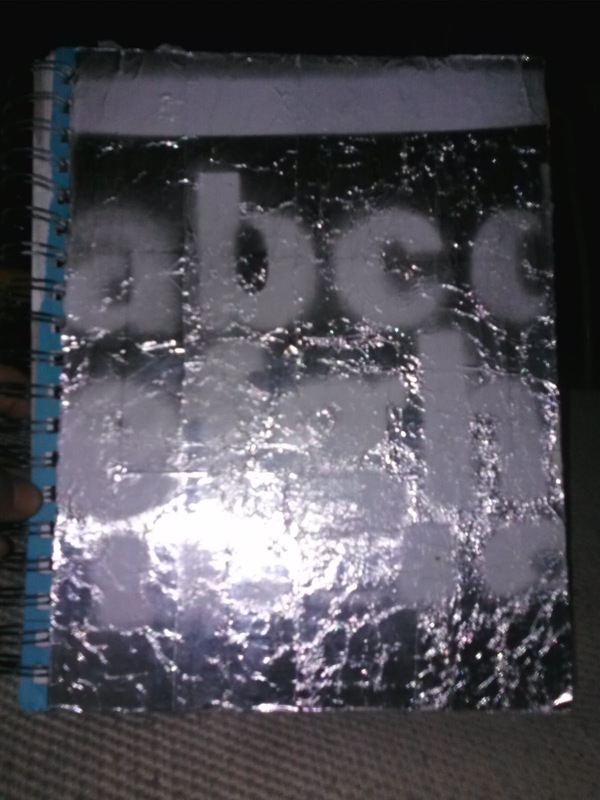 The cover is done with some foil tape I found at the dollar store. I then spray painted on top with white using an alphabet stencil. I finished it with circle stencils in black (not pictured). I then glued down an envelope on the left hand side and cut out some scrapbook paper to make a tag. The envelope was inked up with stamp ink and Distress ink by Tim Holtz. 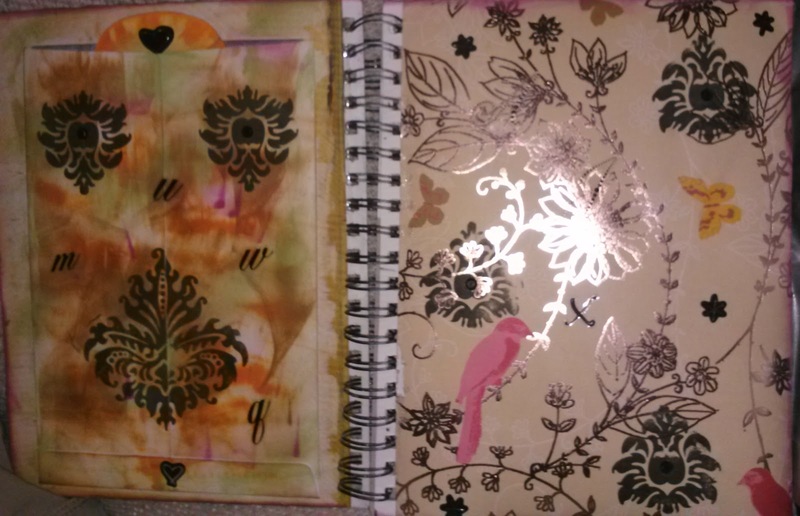 On the left, I glued down some scrapbook paper and then stamped some designs throughout both pages. I then added some alphabet stickers and dots. The tag was inked up and I added staples to the border for a textured feel. I then lettered in and added a sticker to remind the journaler to create. Corny but necessary. The second page I used pastels for the background. I sealed it in with an iridescent gel medium. 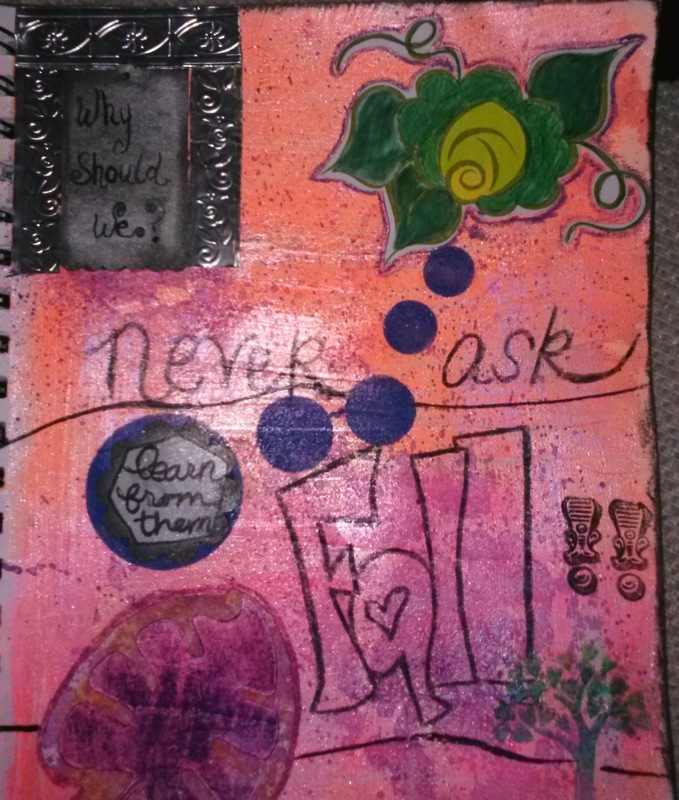 I then used some stencils I had and added them to the page after I ink sprayed them with various colors. I glued them in and colored them in with color pencils. 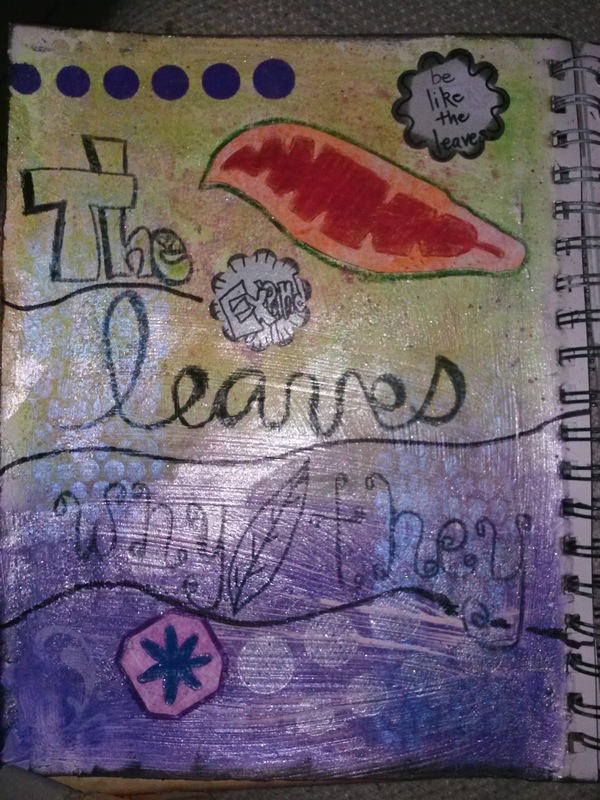 I then added the lettering "The leaves never ask why they fall!!" I added stamps, inked circles, chipboard and a stamped image I cut out and colored. Overall I'm happy with the beginning of this journal and can't wait until my fellow artists get there brushes all in it! So cool! I hv been wanting to try the iridescent gel medium.